The Ocean Alliance, the largest of the three east-west trade vessel sharing agreements, has published its network revamp, which includes the addition of a seventh Asia-North Europe loop. Alliance members CMA CGM, COSCO, Evergreen and COSCO-owned OOCL announced their Day 3 Product, to be launched in April, deploying 330 container vessels with an estimated carrying capacity of 3.8m teu across 38 service lanes. Andy Tung, co-chief executive of OOCL, added: “In today’s tough industry environment and volatility in the global marketplace, it is important that we are able to maintain our operational agility and move quickly to adapt to any changes in the global supply chain. The Ocean Alliance is the final east-west VSA grouping to announce a revamp of its network. The 2M and THE alliances published service amendments and upgrades late last year. 2M partners Maersk Line and MSC concentrated on slowing down the fleet and cutting port calls to add buffer time and improve schedule integrity, deploying a further six ULCVs into their six Asia-North Europe and four Asia-Mediterranean loops to pick up the slack. The smaller THE Alliance, comprising Hapag-Lloyd, ONE and Yang Ming, decided to rationalise its east-west offering with a new pendulum service combining its FE1 Asia-North Europe loop with the transpacific PS1 and PS2 Asia-US west coast strings. However, with COSCO expected to receive around a dozen 19,200-21,200 teu newbuild ULCVs in the first half of this year, the Ocean Alliance has opted to add a seventh loop to its Asia-North Europe offering, with a port rotation of Shanghai-Ningbo-Kaohsiung-Shekou-Colombo-Antwerp-Hamburg-Rotterdam-Port Kelang-Shanghai. “With the addition of the new Loop 7 product, the increased frequency between Asia and North Europe will allow for greater loading flexibility, confidence on service commitments, as well as room for growth through the extended network coverage,” said OOCL. 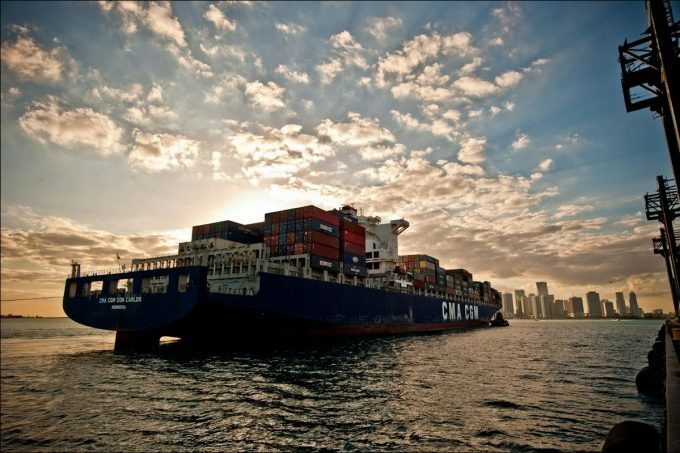 CMA CGM said it would operate 111 ships out of the 330 container vessels deployed on the revised Ocean Alliance network. The number of vessels provide by the other Ocean Alliance members was not disclosed. Globally third-ranked COSCO is the largest partner in the Ocean Alliance with a fleet capacity, including its OOCL subsidiary, of 2.8m teu. Just behind it in fourth place is CMA CGM, which has a total capacity of 2.67m teu. Evergreen has a capacity of 1.2m teu, currently ranking it in seventh place, behind ONE and Hapag-Lloyd. However, the carrier has a substantial orderbook of 440,000 teu, which when delivered will see the Taiwanese line leapfrog both, which only have a combined 42,000 teu of tonnage on order.